In Part 4 I wrote about the need to purchase supplies and how difficult it was to build your preparations without money. Thoughtfully Prepping corrected me, adding this doesn’t mean we should drive ourselves into the poorhouse purchasing tons of “prepper” supplies. That’s 100% correct. New preppers shouldn’t mistakenly believe they need to purchase all the “stuff” so many promote as essential. Stick to the basics. Stay within your budget. There is a paradox when it comes to who prepares. Many affluent people, who have the financial wherewithal to make great preparations fail to prepare at all. Many people with much less money see the need to prepare and work hard to scrimp and save so they can stockpile a few essentials for a rainy day. Why is this? I call this the lesson of sweat-soldering copper pipe. Watch students learn how to solder copper pipe. You can emphasize safety. They’ll keep their hands away from the flame, that’s pretty scary. They know what a direct torch would do to flesh. You’ll tell them to remember metal is a good conductor and that it gets very hot and could burn them. They won’t touch the soldered joint directly. They get that. Without fail, at least one student, who usually does a great job soldering, will grab the end of a short practice pipe they just soldered. He’ll be excited to admire his wonderful work close up. Clink. The pipe hits the ground and a few curses echo throughout the shop. The thing is, this student will never burn himself again when soldering. The lesson is burned into their brain. There is a big difference between an intellectual knowledge of something and a visceral understanding of it. Everybody knows metal is a good conductor. Ergo, if you heat one end of a short pipe with a torch, you should be careful about grabbing the other end. That’s not the same thing as having experienced it yourself. Why do people become preppers? For many, they’ve experienced some visceral event indelibly burned into their brain, no different than if they touched a hot copper pipe. Some preppers struggled financially. They physically despise credit cards and not having financial reserves. They know what it’s like not to have food in the pantry. Those who lived through the Great Depression stuff their pantry. They hesitate to throw things out that could be repurposed. This is a visceral response. The modern family who has always had money might intellectually realize they could suffer a job loss. Maybe later they’ll save something, after they buy a new car. Many preppers have a military background. Too many have seen things no human should be forced to experience. If you’ve seen the evil that can befall the innocent, it’s difficult to allow yourself to be defenseless in the future. Difficult, but not impossible. Some people can build up walls of denial that what they’ve seen can’t happen to them. Soldiers who served in Somalia shake their heads and say it couldn’t happen in America, ever. People who’ve witnessed a violent assault rationalize they’d never be the target of such pointless violence, ever. The sad fact is, you can’t save everyone. It doesn’t matter how much you love them, care about them, and want the very best for them. Some people will dismiss good advice and won’t face unpleasant realities. Some people will be paralyzed by fear or inaction or something else and you just can’t help them. Experts who study survivors of disasters know this. In airplane crashes or boat capsizes, many passengers will freeze. They’ll just shutdown. You can’t lead them to safety as we see in the movies. They won’t respond, and you’ll only perish if you try to save them. This is a hard thing to come to terms with for many people. 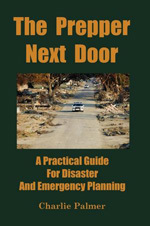 Preppers who realize this focus on preparing themselves and their family. Sound words. I’m ex-mil and the depravity of some people doesn’t surprise me anymore. Having also worked security in all forms in the UK, those thinking animals are only found in the third world need to wake up a bit. We used to have our own version called the CHAV. An acronym for Council Housed And Violent. They are now mere children compared to the ethnic groups you find in the UK of today. I’m not a fan of collective security though. Unless they train together, plan together, and virtually live together, I’ve found that (I politely say) personal protection wins every time in civvie street i.e. looking after yourself. Thus it’s good to have friends YET don’t rely on anyone apart from you and your own. After all a block defense plan is no good if the first time there is trouble you see your over watch disappearing into the distance in a haze of turbo charged exhaust fumes.